The Edinburgh Festival comes round faster every year, and it’s hard to fit in seeing shows with work. This year, however, we made an effort, as the Nederlands Dans Theater was back in town. We managed to see them a few years ago, Dan’s first time to see a contemporary dance show. That time, they put a sprinkler on stage during one of the pieces, so that by the end, the dancers were kicking water at each other and doing skids along the stage, all to very elegant strains of Bach. This time, no sprinklers, but a combination of films showing on panels and dancers interacting with them. One of the most striking points was when one dancer came up out of the orchestra pit with a huge black fabric train behind her. As she moved further back on the stage, the train filled the stage. If it wasn’t based on part of a real silent film, it deserved to be. The theatre included a lot of well-dressed dance fans. We hoped that we didn’t let the side down by zooming across the road for a bag of chips in the first interval…but they were well worth it. As was the dancing. After a long time of going past the Murrayfield stadium on the train, finally got to see inside…We went to watch Scotland v Australia yesterday, with my mum and dad. My brother is a rugby teacher, so Dad went to LOTS of matches with him in earlier stages. Dan and I are no way as knowledgeable, but it seemed a good option for a day out together. 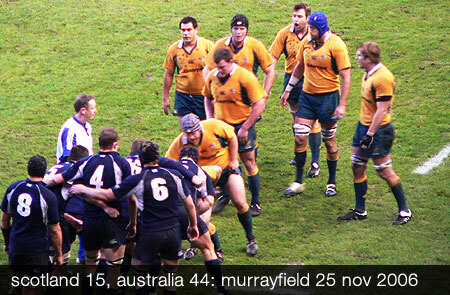 They said that the crowd was the biggest ever for a Scotland – Australia match: over 62000! We could certainly see almost all the seats filled. 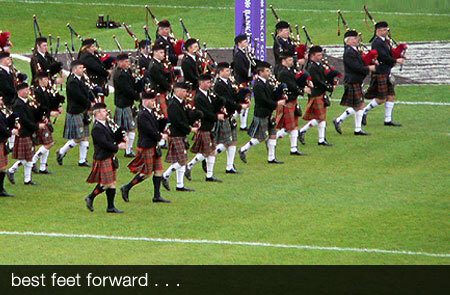 The section before the match included a pipe band, anthems etc. When the Scottish team ran onto the pitch, they let off fireworks at each end (a subtle purple). They also had black boxes on wheels that blew flames at this point. Best part of the match: seeing a try scored right at our end in the first 10 minutes. Seeing Australia win by over 20 points was less good, but it was still a good match to watch. The crowd was also quite entertaining: at one point, 4 Father Christmases came up the stairs nearest us. Later on after the interval, only 2 returned…was it something in the pies? Thankfully we had dry weather all match, and came home to a big pot of stew all ready for us. It’s not so much the winning as the taking part in eating.